The Society of Women Engineers (SWE), the largest global organization in support of the advancement of women in engineering, is organizing WE Local India, its annual conference and career fair in Bengaluru. The three-day event began on 11th April and will continue till 13th April at the Sheraton Grand Bengaluru Whitefield Hotel & Convention Center. The objective of the event is to provide women in engineering a platform to advance in their careers, connect with like-minded professionals, learn life and work skills, and network with job recruiters. The first day of the event saw workshops and plenaries on mentorship, gender bias, leadership, and networking. It also included interactive sessions on technology related subjects like automation, deep learning, blockchain, machine learning & analytics and artificial intelligence. The event kick-started with a keynote address from Sabina Nawaz (Nawaz Consulting, LLC.) on dealing with negativity and achieving goals. Later in the day, a session on Successful Strategies for Navigating Bias in Engineering Workplaces was conducted by Rachel Korn, Ph.D., Director of Research, Center for WorkLife Law. The line-up for the next two days includes panel discussions, educational sessions, and workshops on organizational and technology topics, and a closing keynote from Smita Tharoor (Tharoor Associates). A free and open-to-the-public career fair will be organised on the last day. This will feature 20+ global organisations recruiting job candidates onsite. “WE Local is our initiative in pursuit of providing professional and personal support for women to advance their careers as engineers and technologists. We strive to inspire and prepare women in engineering to grow in their careers. 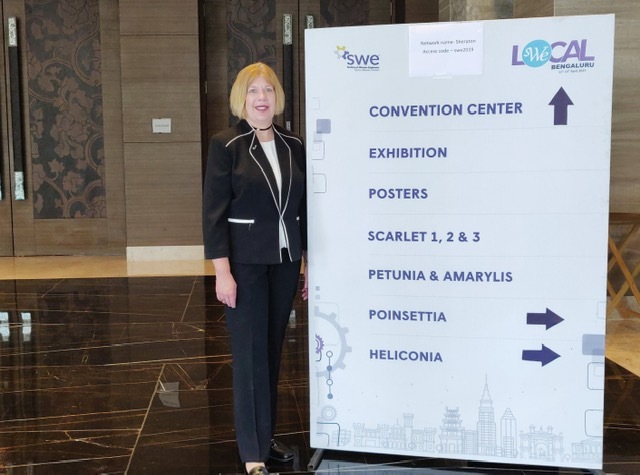 We hope that this platform will encourage women from all the professional stages to take the leap toward leadership and career expansion,” said Karen Horting, CEO and executive director of SWE. SWE is a non-profit membership organization with more than 40,000 members across the globe. SWE has 437 members in India, including 124 in Bengaluru where WE Local took place this year.